Cody Heitman will be representing the Mustangs of Southwest Minnesota State University this Saturday at RCTC. SMSU is a Division II wrestling program out of Marshall, MN. Wrestling begins at 10:00 a.m. at the RCTC Field House. It would be great to get a few of us to attend and support Cody! Contact Link if you are interested in riding down. Youth Wrestling Season Starting Soon! The youth wrestling season will be starting soon and we’d like you to join us! Last week, each child in the public and private schools in 6th grade and under should have received this flyer. We hope to relay this information to as many parents and youth as we can. Please help us out by sharing this post! New to wrestling or looking to try it again? We are offering 2 free practices on November 10th and 17th. These practices provide the opportunity to learn more about the sport without any commitment. See the flyer for more details. Registration is Monday, November 17th. We’ll cover practice schedule, important dates, and other essential information. You can get a head start and download the registration form and bring it with you on the 17th. Finally, a good read as to Why Your Child Should Consider Wrestling. 6 ZM wrestlers competed in the Cliff Keen USAW Preseason Nationals in Cedar Falls, IA this past weekend. 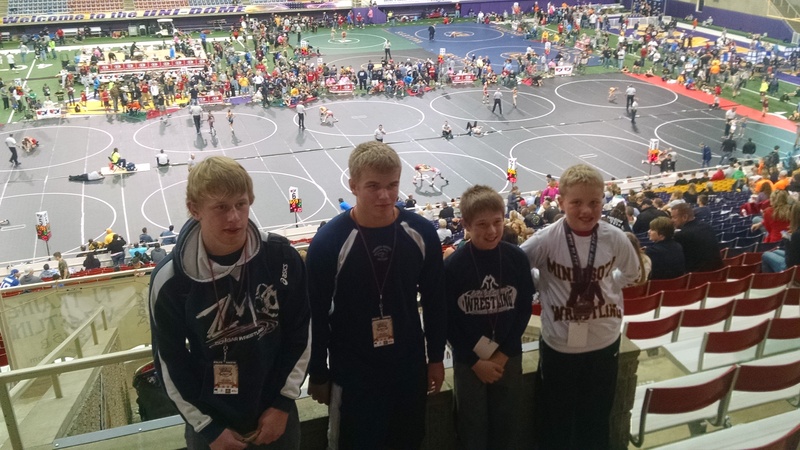 Pictured are Jacob Bennett (2nd), Tyler Soltau (7th), Michael Majerus, and Ryan Lexvold (8th). Also attending were Spencer DeFrang and Hayden Stensland. These guys are excited for the upcoming season and represented ZM very well. Author Chris LexvoldPosted on October 27, 2014 November 16, 2014 Categories Results, YouthLeave a comment on Youth Wrestling Season Starting Soon! Pine Island is having a 2 night camp for Grades 3 through 12 November 10th and 11th. Registration form is here for anyone interested. We have no key to get into the room.